The Custom Suit upgrade. Free Shirt for New Clients*. Custom clothing adds presence, energy, and relevance to your image. Ready to Get Started? How did we flatter clients' body types? And keep lifestyle and personality in mind? We asked a few dozen eager clients to give our Designers free reign while creating their new image. The Designers found out who these clients got in front of and what they wanted their image to communicate most. Over 24 individual measurements were taken. The Designers even photographed the clients’ posture, profile arm position, and shoulder slope to share with the Master Tailor’s cutting apprentice. Each client felt a surge of confidence wearing their new perfectly tailored and personalized designs, and they could easily rotate their existing clothing into their new Perfect Image. Which means, until they build up their custom wardrobe, their first custom suit and shirt gives them more than one look that flatters their body type from any angle. On-the-go Todd wears a suit infrequently, but when he does, he needs it to show off his fit physique and look professional. Our Designers recommended a two button high notch lapel jacket and flat front trouser with slim leg in in Super 130s subtle navy shadow stripe, $1595. BEFORE: Todd’s long suit jacket and baggy pants make him look shorter and heavier. He made a quick, hasty decision when originally choosing this off-rack black suit, not knowing that it would look sullen and black should be reserved for tuxedos and formal wear. 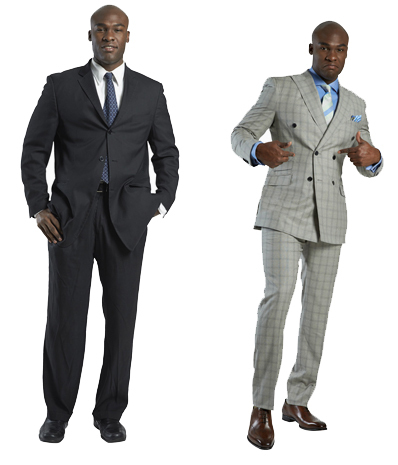 AFTER: A shorter jacket and trouser make Todd seem taller and shows off his trim physique, essential to his business. Says Todd, “This suit shows off my actual size and makes me look more professional...and I can wear this subtle navy blue suit twice in a week by changing up the shirt and tie if I need to." Tech superstar Evan also wears a suit infrequently, but he needs to look in control and worthy of the CIO role he's been eyeing - or the startup he's considering joining. Our Designers recommended a two button high notch lapel jacket and flat front trouser with slim leg in Super 130s navy blue, $795. BEFORE: Evan was swimming in his suit, which looked two sizes too big. The lower lapel was trendy in the 1990s and the three button jacket did not flatter his height. AFTER: His sleek new custom look combines a modern silhouette and subtle check in an updated shade of blue to give him more presence and polish. He wanted to enhance his height, so his two button jacket was made with a higher notch lapel, and his pant with a flat front and slimmer leg. Finance Frank, as he's known in the office, wears a suit every day and wanted to shed his image of an older accountant with bad style, especially around his team of young MBAs. Our Designers gave him a fresh alternative to the two button jacketwith a double breasted suit in Super 130s charcoal solid, $1495. 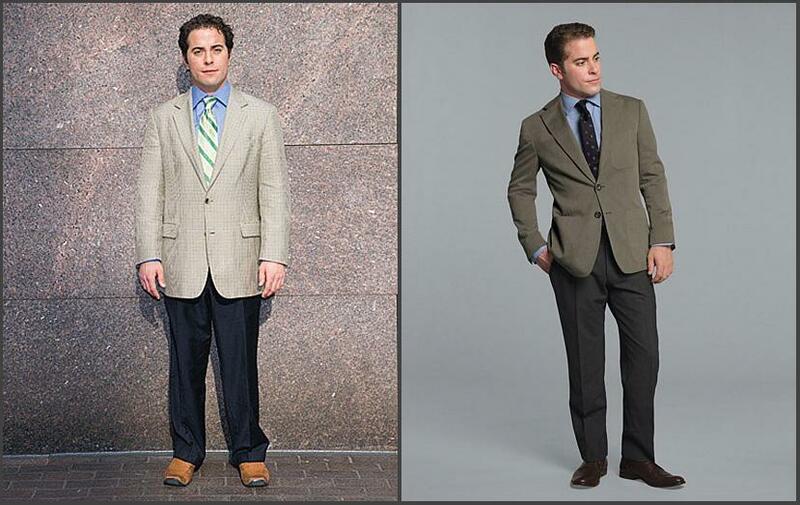 BEFORE: Frank thought that extra fabric would hide his extra midsection weight, and in true practical fashion, bought three of the same suit in different colors during an annual sale at an upscale retailer, and skimped on the tailoring because he didn't see the value for the extra spend. AFTER: This is an extreme case of new proportioning, but the new cut takes years and pounds off, as well as giving a more sophisticated look, demonstrating his lead over the younger, and slimmer suit wearing MBAs. Typically, our Designers may recommend a slightly less “over-fitted” look but this definitely takes Frank from a stodgy CFO to one with relevance. Michael wears suits every day and is known for being a closer, but never gave off quite the right first impression due to his loose fitting clothes magnifying his athletic physique. Our Designers created his new look with a double breasted jacket and flat front trouser with slim leg in in Super 130s light grey and blue check, $1225. BEFORE: Michael’s suit is pretty shapeless and doesn’t do him any favors. He's an ex-athlete and the loose clothing dulls his sharpness and exaggerates his size, sometime intimidating others. 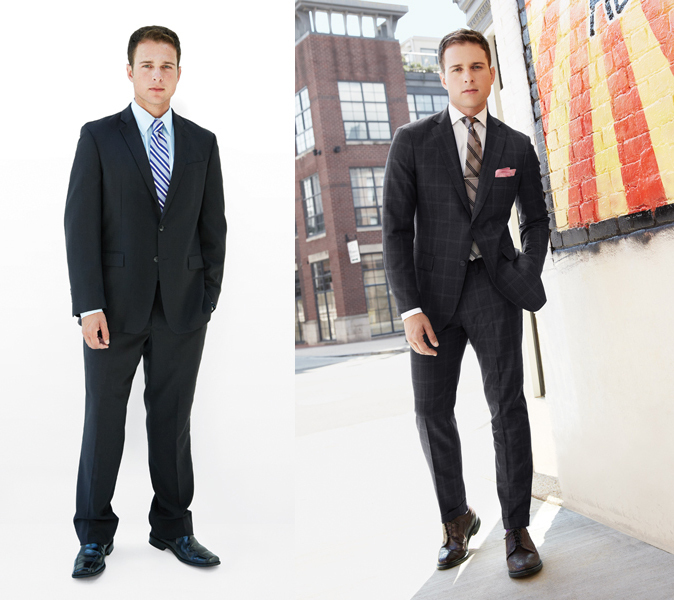 AFTER: A slimmer waist and more closely fitted double breasted jacket help Michael elevate his look, energy, and give him more sharpness and presence – an asset in his competitive Sales job. He's now greeted with an intriguing, "who is this guy" look when meeting with new prospects. Dominic, a veteran investment banker, handles M&A transactions instinctively, but his lack of tailoring and style make him look like he still uses a Palm Pilot and thinks a unicorn is an animal. Our Designers made him relevant once again with a two button high notch lapel jacket and flat front trouser with slim leg in in Super 130s light grey check, $1725. BEFORE: The shapeless cut of Dominic’s suit makes him look a bit dated. AFTER: His custom looks feature a light grey check and a navy pinstripe in a tailored modern cut, showcasing a more narrow lapel, trimmer sleeve, and hint of cuff. These features combine to give his new looks more presence, energy, and relevance. We also suggested using a hair product, adding 30 seconds to his morning routine. Bradley, a road warrior healthcare consultant, needs to give a great first impression of his business acumen to new clients but he travels with two outdated suits, insisting that his trousers fit since he paid for alterations. Our Designers sharpened his look with two button high peak lapel jacket, $995, and flat front grey trouser with slim leg, $275 (the modern shorter hem is optional). He can mix up the look by pairing the jacket with a navy trouser or dark denim, and wear an updated blue blazer with the grey pant. 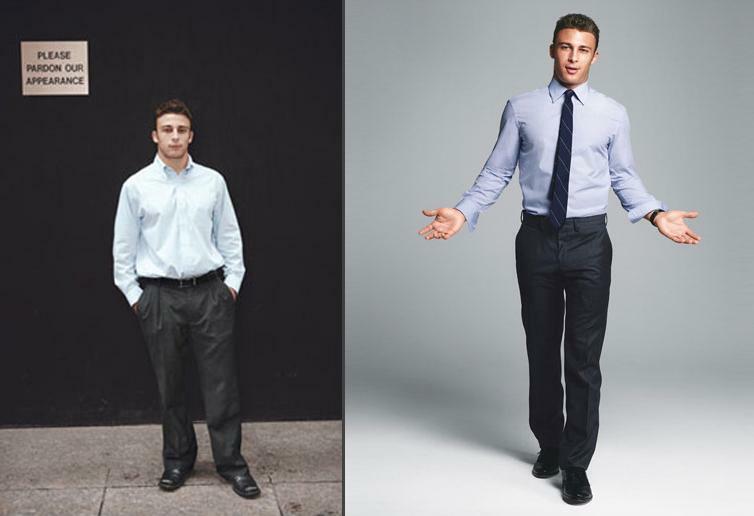 BEFORE: Brad’s long suit jacket and baggy pants make him look shorter, sloppy, and he thinks business casual means suit with no tie. This particular suit does not give a great first impression, of Brad, his work, or the company he represents. AFTER: We updated Brad’s look to a proper fitting jacket with updated length and more fitted body and arms which more accurately reflects the attention to detail he gives to his work – imperative in his line of work since he’s meeting with new clients continually. Brad is actually in great shape, and now he looks more energetic and on point. *The images in the thumbnail gallery above are not Nicholas Joseph images. We make no claims to the image or the contents of the images. All rights are reserved by their respective owners.